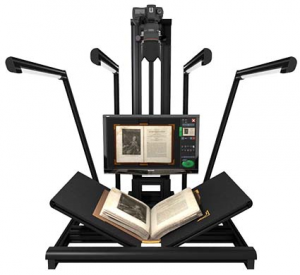 It is with Great Pleasure that Digital Scanning & Microfilm Equipment – DS & ME is able to announce the delivery this week of a METIS model GAMMA – EDS [ Easy Digital Scanner ] Book Scanner to the National Archives of the Solomon Islands. With this latest installation of this latest METIS model EDS Gamma A4 to A0 Size Book Scanner with an Auckland based Commercial Scanning Bureau – Heritage Studios – previously AP Digital Consultancy Ltd, Digital Scanning & Microfilm Equipment – DS & ME continue their ongoing successful relationship in the installation of our Commercial Range of Book plus Large Format Fragile Document Scanners from several manufactures in Austria, China, Germany & Italy, up to TRIPLE A0 in Size in the Australian, New Zealand, Papua New Guinea & Oceania market. This latest installation of this METIS model EDS Gamma A4 to A0 Size Book Scanner with an Auckland based Commercial Scanning Bureau – Heritage Studios – previously AP Digital Consultancy Ltd this brings the number of METIS model EDS Gamma A4 to A0 Size Book Scanner in the Australian, New Zealand, Papua New Guinea & Oceania market to THREE-3 units. The National Archives of the Solomon Islands will utilise the METIS model GAMMA – EDS [ Easy Digital Scanner ] Book and Large Format Fragile Material Flatbed Scanner to capture the Historical Documentation both in Book & Large Format Fragile Material from A4 = 210 x 297mm to A0 = 841 x 1,189mm in size. The METIS model GAMMA A4 to A0 Scanner was delivered in July 2017 and installed by our Auckland NZ representative Andrew Pettengell of Heritage Studios – previously AP Digital Consultancy Ltd in early August 2017. The people at the National Archives of the Solomon Islands are very pleased with the installation. In addition Andrew Pettengell who had not had any previous hands on experience with the METIS model GAMMA A4 to A0 Scanner prior to carrying out the installation & the training of personnel at the National Archives of the Solomon Islands had this to say about the METIS model GAMMA A4 to A0 Scanner once he had completed the installation & training. WOW, I have to say, that METIS model GAMMA is an awesome piece of Book & Large Format Scanning KIT !! Needless to say DS & ME is most pleased with this assessment from Andrew Pettengell of Heritage Studios – previously AP Digital Consultancy Ltd.
With the delivery of the METIS model GAMMA – EDS [ Easy Digital Scanner ] Book and Large Format Fragile Material Flatbed Scanner to the National Archives of the Solomon Islands to TWO-2 Book and Large Format Fragile Material Flatbed Scanners in the Oceania Region along with the SMA Electronic Document GmbH Large Format A 2 Plus Oversize Material Book Scanners the SMA model SCAN MASTER 2 installed with the Cook Islands Governments – Ministry of Justice at Avarua, Rarotonga in February 2012. 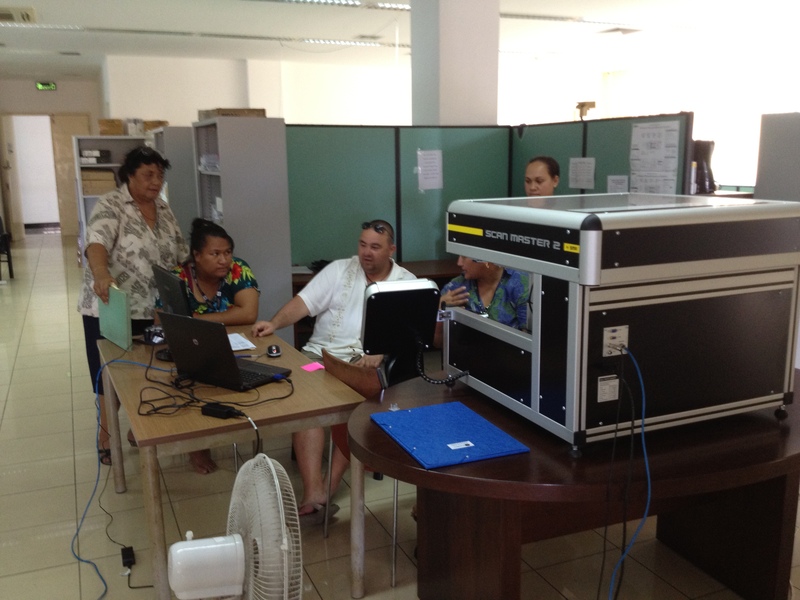 Ralph Fuchs the Director of SMA Electronic Document GmbH is seen here providing operator training on the SMA model SCAN MASTER 2 Large Format A 2 Plus Oversize Material Book Scanner at the Cook Islands Governments – Ministry of Justice at Avarua, Rarotonga – the Cook Islands. With the total number of GAMMA installations worldwide @ NINETY EIGHT – 98 UNITS in 2016. For the project of the digitization of the Cadastral Registers of the Italian Territory Agency, GAP S.r.l Rome used TWELVE 12 EDS GAMMA Scanners progressively located at SIXTY FOUR 64 different locations and GAP captured a total of around FIFTEEN 15 million pages. The maximum production GAP produced per day with one GAMMA Scanner was 11,000 images = ( 22,000 pages ) in a TEN 10 hour shift. The daily average number of scans produced, over the capture project, was of around 7,000 images = ( 14,000 pages ) per GAMMA unit per TEN 10 hour shift. In addition to the Low Entry Level METIS EDS Range of ALPHA & GAMMA Book & Flat Bed Scanners the METIS Range also includes the TOP OF THE LINE for Professional Applications METIS – DRS models of Flat Bed Scanners for Book/s & Large Format Documents which can scan material up to a Maximum of 2,000 x 1,210 mm = ( 78.7 x 47.64 inches ) or over DOUBLE A 0 + in size & up to 200 mm = ( 7.874 inches ) thick all of which integrate a ( Patent protected technology ) the DC SynchroLight – The perfect merging between extreme quality and productivity for the most demanding market. Designed for the quality scanning for Digitisation Projects of Oversize Material such as Drawing/s, Map/s, Papyrus, Scroll/s, Parchment/s, & also Book/s, Atlas/s, etc. plus Fine – Art, Decor and Professional Cartography applications. In addition the METIS Systems Group now have added the METIS SUPERSCAN PM3D the first industrial scanner able to acquire Colour and 3D surface embossing based on new METIS PM3D® technology ( Patent protected ). The SUPERSCAN PM3D ® is the first scanner to breach the resolution limits caused by the number of pixels in the imaging sensors thanks to an innovative opto-mechanical design that allows a native optical resolution of 1,200 PPI on the full scanning area ( 2,000 x 1,300 mm ). Thanks to the Scan Merge tool scanning very large originals (exceeding the scanning area) is now also possible with perfect results. The SUPERSCAN PM3D ® adopt the new METIS Scan Director software that have been designed specially to fulfil the requirements of the industrial, fine-arts and decorative markets and for handling 3D data.